With one year to go until the 4th Islamic Solidarity Games begin in Baku, senior executives from the Islamic Solidarity Sports Federation (ISSF) Coordination Commission have arrived in Azerbaijan's capital to evaluate preparations for the Games. The 4th Islamic Solidarity Games is an exciting multi-sport event uniting the Islamic world to take place in Baku on May 12-22, 2017. 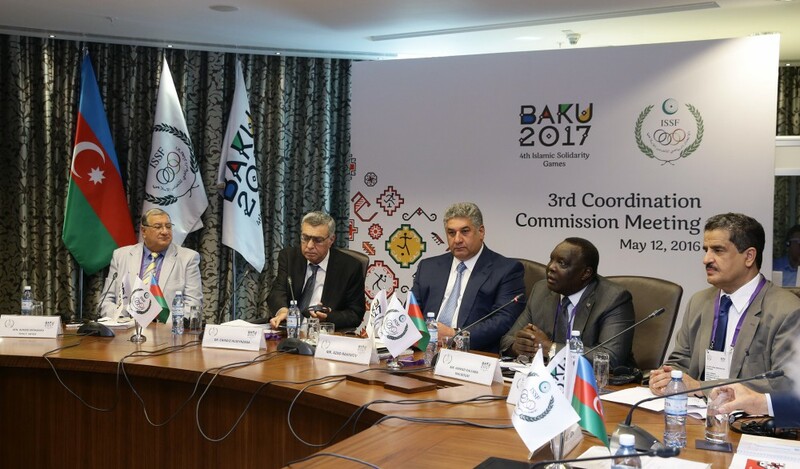 The Coordination Commission's delegates, chaired by 1st Vice President of ISSF Col. Hamad Kalkaba Malboum, attended a meeting, which featured a series of presentations delivered by the Azerbaijan Islamic Games Operations Committee (AISGOC). The seminar provided detailed updates on the event venues, sports programme, opening and closing ceremonies, and other organizational developments. Speaking at the event Col. Hamad Kalkaba Malboum noted that Azerbaijan is a country with a strong heritage in the sporting world. “We are sure that as a host country of the 4th Islamic Solidarity Games, Azerbaijan will put on a world class event for athletes and spectators. We were delighted to be back in Baku and to hear about the significant and impressive progress made in preparations. We appreciate the team spirit of the Organizing Committee and are looking forward to celebrating the one year to go milestone," he said. Azerbaijani Minister of Youth and Sports Azad Rahimov, who is also CEO of AISGOC, for his part, talked about the importance of hosting the Commission in the capital. ”Hosting the Coordination Commission here in Baku once again gave us an opportunity to update them on the significant progress we have made since their last visit and receive their valuable input into our operational plans. Azerbaijan has a reputation of delivering big sporting events successfully and we are confident the Coordination Commission was impressed with our progress. We look forward to hosting the next Islamic Solidarity Games in our capital city in May next year," he emphasized. During the meeting, the Games’ logo and brand were presented to the participants, prepared by a group of national designers. The logo combines the history, heritage and culture of the Islamic countries. The 11-day Games will welcome up to 5,000 athletes from Islamic states around the world, featuring 20 different sports including 24 disciplines such as Athletics and Para Athletics, Aquatics – Diving, Aquatics – Swimming, Aquatics – Water polo, Basketball 3x3, Football, Gymnastics – Artistic, Gymnastics – Rhythmic, Wushu, Table tennis, Handball, Judo and Blind Judo, Wrestling – Greco, Wrestling – Freestyle, Shooting, Tennis, Volleyball, Boxing, Zurkhaneh, Karate, Taekwondo and Weightlifting. Nearly 8,000 volunteers will be involved during the sporting event. The games will be held in 16 modern competition venues of Baku. Meanwhile, Rahimov said that no new arenas will be built for the Islamic Games. Azerbaijan's capital city Baku was awarded the Games at the General Assembly of the Islamic Solidarity Sports Federation (ISSF) in Jeddah in July 2013.